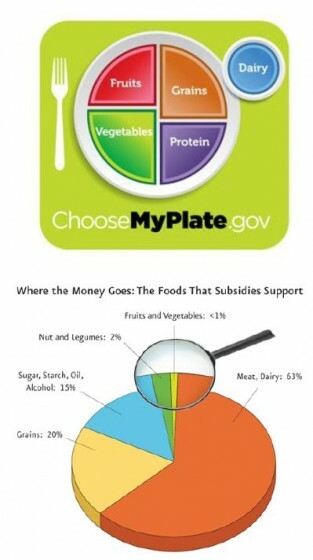 Seattle Nutritionist writes: The USDA unveiled its new food plate model to replace the food pyramid. 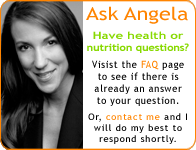 It suggests to Americans that they fill half their plates with fruits and vegetables. The USDA’s new plate model could not be more at odds with federal food subsidies promote high fat, high calorie food products and grossly under-subsidize fruit and vegetable crops. Both the U.S. Department of Agriculture’s icon and its recently released dietary guidelines ask Americans to limit their intake of sweeteners and fat- and cholesterol-heavy products, including meat and dairy, and to eat more fruits and vegetables. But more than 60 percent of agricultural subsidies in recent history have directly and indirectly (corn production for feed) supported meat and dairy production. Less than 1 percent goes to fruits and vegetables.